Three times a day, alarms ring out through the streets of China’s ancient Silk Road city of Kashgar, and shopkeepers rush out of their stores swinging government-issued wooden clubs. China’s worst fears are that a large-scale attack would blight this year’s diplomatic set piece, an OBOR summit attended by world leaders planned for Beijing in May. 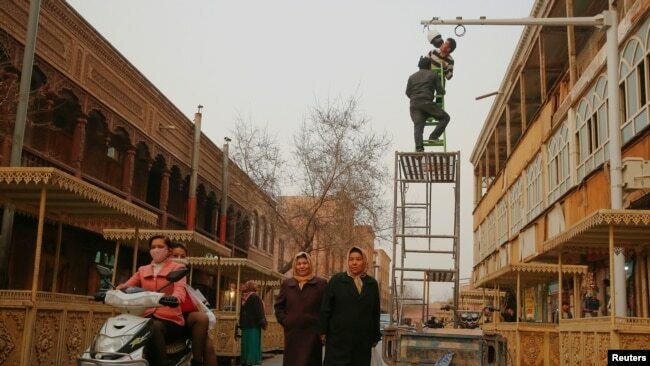 Men install a camera in a shopping street in the old town of Kashgar, Xinjiang Uighur Autonomous Region, China, March 23, 2017. 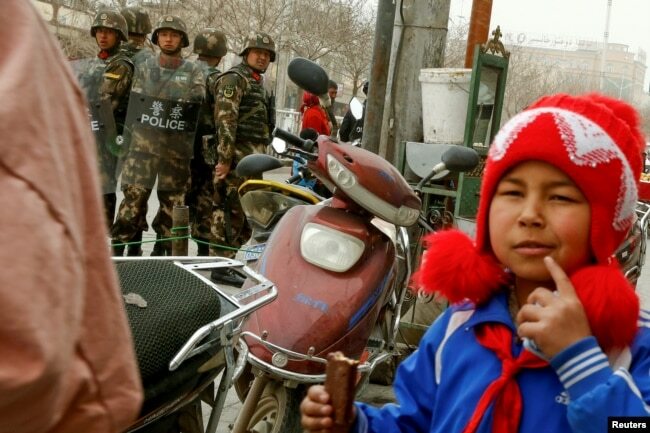 But many residents say the drills are just part of an oppressive security operation that has been ramped up in Kashgar and other cities in Xinjiang’s Uighur heartland in recent months. 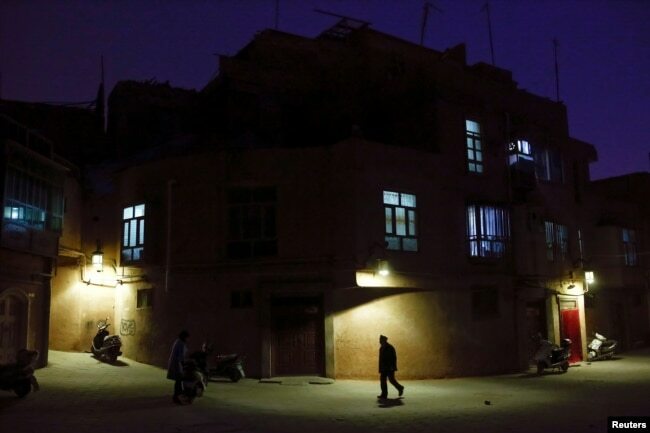 For Uighurs like the owner of an online multimedia company facing one of Kashgar’s main streets, it is not about security, but mass surveillance. Security personnel keep watch in a street in Kashgar, Xinjiang Uighur Autonomous Region, China, March 23, 2017. A police officer checks the identity card of a man as security forces keep watch in a street in Kashgar, Xinjiang Uighur Autonomous Region, China, March 24, 2017. At one such event witnessed by Reuters in Hotan, a former Silk Road oasis town 500 kilometers (300 miles) southeast of Kashgar, more than 1,000 people filed onto an open-air basketball court where party officials checked their names against an attendance list and inspected their dress and appearance. 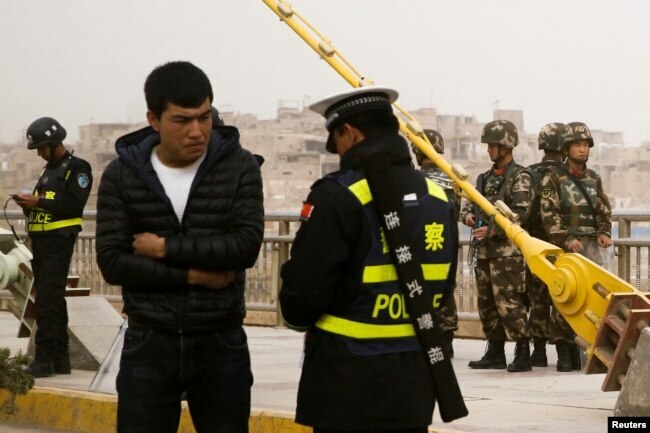 Hotan authorities offer 2,000 yuan ($290) rewards for those who report “face coverings and robes, youth with long beards, or other popular religious customs that have been radicalized,” as part of a wider incentive system that rewards actionable intelligence on imminent attacks. The architect of the anti-terror drills and other new measures in Xinjiang is Chen Quanguo, who was appointed Communist Party boss in the region in August in what analysts said was an implicit endorsement of his hard-line management of ethnic strife in neighboring Tibet. 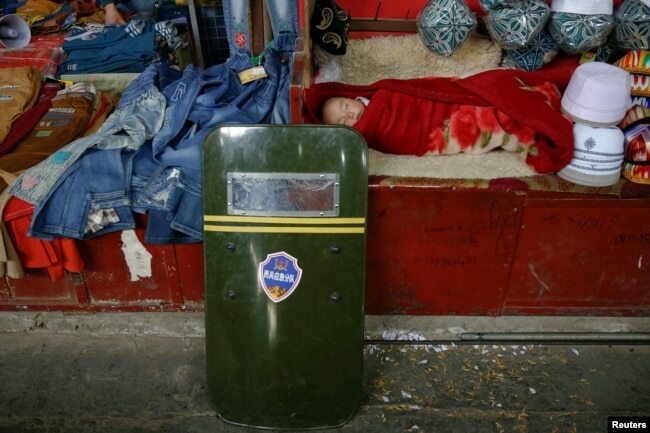 A child sleeps as a riot shield leans on a stall at the bazaar in Hotan, Xinjiang Uighur Autonomous Region, China, March 21, 2017. One of Chen’s most visible initiatives has been to build thousands of what the authorities call “convenience police stations” across Xinjiang and to hire 30,000 officers to man them. Citizens are encouraged to use the stations to charge their mobile phones, have a cup of tea or take shelter from the elements. “I don’t know anyone who has been in there,” said one Han Chinese taxi driver, who wanted to be identified only by his surname, Huang, suggesting few have taken up the offer to huddle beside the riot police and soldiers who occupy the stations. Police spot checks of documents are carried out on pedestrians, with mobile phones inspected for extremist videos or use of banned chat applications like Telegram, WhatsApp and Twitter. Mobile internet speeds have been slowed from 4G to 3G. When asked about the reason for the security, one of the officers said Kashgar’s preparations for OBOR were of paramount importance. “When you see military and police vehicles patrolling the street in your country, what do you think it’s for?” he said.